Hot Cross Buns - A Good Friday Tradition | We Like to Cook! For some, hot cross buns are synonymous with Good Friday. 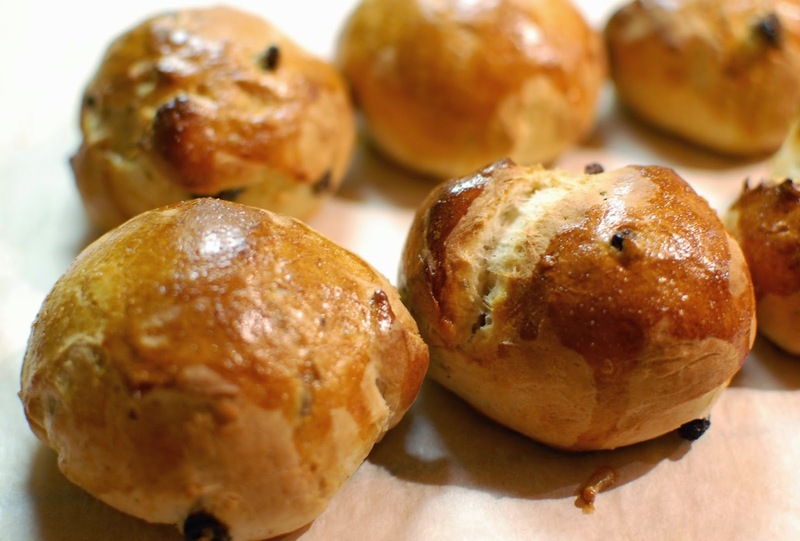 Hot cross buns have a long history that goes back hundreds of years. 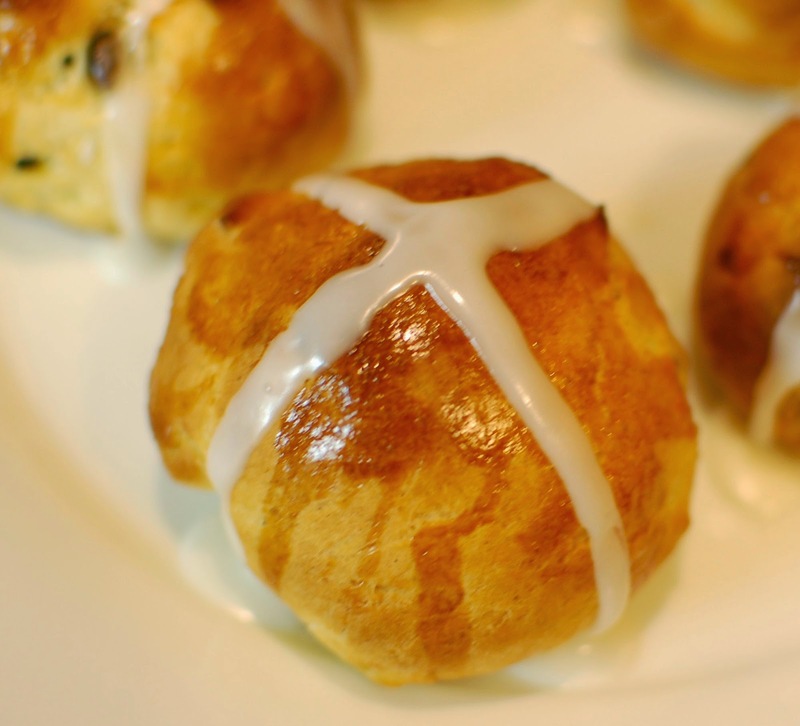 These special sweet buns, marked with a symbolic cross in celebration of the resurrection of Jesus Christ, are a fixture on many Easter tables and are historically considered to be blessed. Many believe that sharing a bun with a friend will bring both the giver and receiver good luck and continued friendship for the following year. These lightly-sweetened, fruit-filled treats were sold in the streets of England during the nineteenth century to the cries of "hot cross buns; hot cross buns; one a penny; two a penny; hot cross buns!” With such a diverse past, it it clear that hot cross buns are a lovely and meaningful Easter tradition. In a small bowl, stir together milk, yeast, and 1 teaspoon granulated sugar. Let mixture stand 5 minutes, or until foamy. In a separate large mixing bowl, combine flour, spices, salt, and remaining granulated sugar and mix together with a whisk. Using a pastry cutter or two knives, cut butter into bits and blend into flour mixture until the mixture resembles coarse meal. Lightly beat 1 egg with the egg yolk. Make a well in center of flour mixture and pour in yeast and egg mixtures, currants, raisins, and orange and lemon zest. Stir mixture until a dough is formed. Transfer dough to a floured surface and knead until smooth and elastic, about 10 minutes. Transfer dough to an oiled large bowl and coat lightly with oil. Let the dough rise, covered with plastic wrap, in a warm place until doubled in bulk, about 1 1/2 hours. Preheat your oven to 400°F and butter 2 large baking sheets. On a floured surface with floured hands knead dough briefly and form into two 12-inch-long logs. Cut each log crosswise into 12 equal pieces. 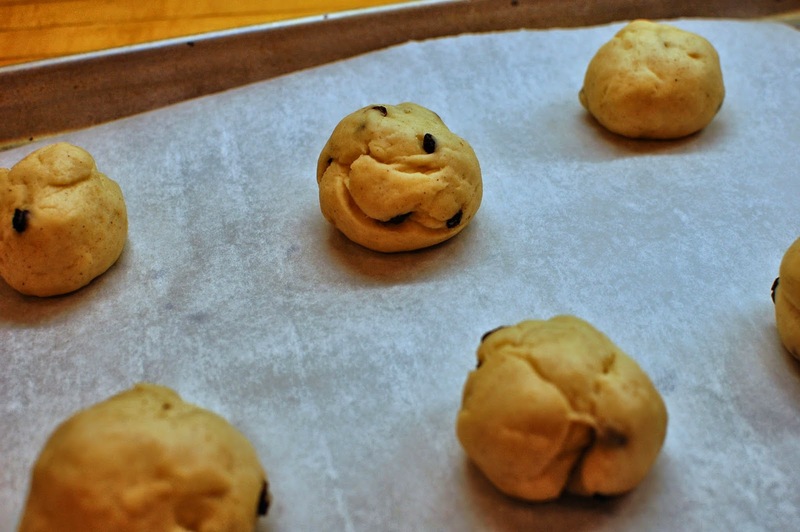 Form each piece into a ball and arrange about 1 1/2 inches apart on baking sheets. Let buns rise, covered, in a warm place until doubled in bulk again, another 45 minutes. While buns are rising, lightly beat the remaining egg with confectioner’s sugar to make an egg glaze. Brush buns with egg glaze before baking them in upper and lower thirds of oven, switching position of sheets halfway through baking, until buns are golden brown, about 12 minutes. When done, transfer buns to a rack to cool slightly. In a small bowl, mix together confectioner’s sugar and lemon juice or water. Use a spoon to drizzle the glaze over the buns in a criss-cross pattern. Serve buns warm or at room temperature with softened butter and your favorite preserves. These delicious buns can be made one week ahead and frozen before being frosted, wrapped in foil and put in a re-sealable plastic bag. Thaw buns and reheat before serving.